HONOLULU — When you imagine Hawaii, what do you think of? Perhaps hula girls dancing seductively at sunset, wearing grass skirts, coconut bras, and a flower lei? Or Waikiki beach boys in swim shorts, surfing peaks with Diamond Head looming behind them? Possibly a stone-faced tiki nestled alongside palm trees and a raging volcano? You know the images I’m describing. Because for over a century, these exotic scenes of paradise were deliberately crafted by travel companies and ad agencies and widely circulated to shape a specific narrative about Hawaii. 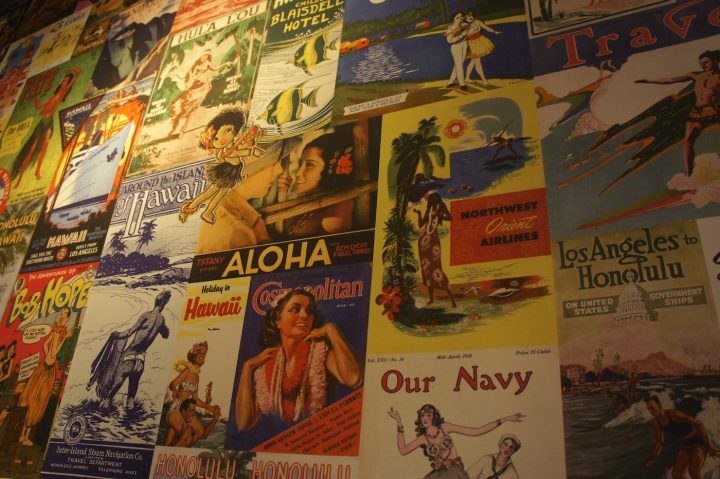 When the Matson shipping company — which had been hauling freight between the West Coast and Hawaii since 1882 — began expanding its tourism offerings in the early 20th century, they hired a San Francisco agency to create an extensive ad campaign of travel posters and memorabilia that depicted Hawaii as an alluring tropical fantasy. Through colorful, illustrated caricatures of “island life” and photographic prints of relaxing women and beach scenes by famous photographers, including Anton Bruehl and Edward Steichen, the imagery stuck. “Many are the strange things to be learned about [Hawaii]. However diligently the foreigner seeks he cannot find out all. He gets a fragment here and there and goes home. A heap of absurdities is all he has to show from great [Hawaii],” observed 19th-century Native Hawaiian historian Kepelino. His words are the preface to a current installation, Unreal: Hawai‘i in Popular Imagination, at the Bernice Pauahi Bishop Museum in Honolulu. 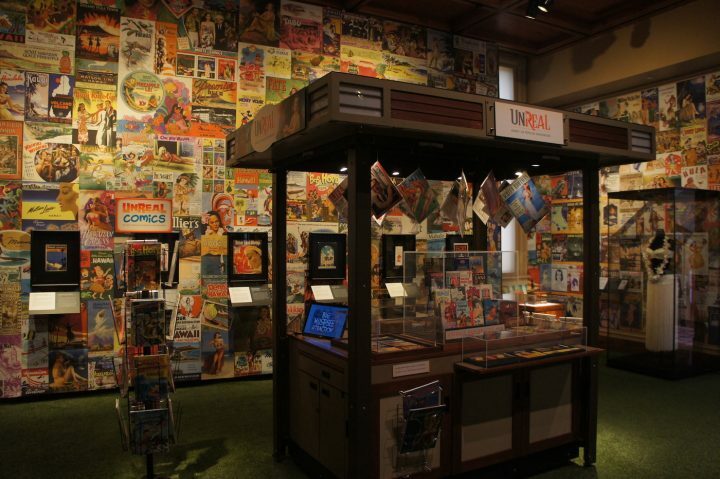 At one end of the gallery is an assemblage of rare illustrations, posters, postcards, and other vintage ephemera, including matchbooks and comics, drawn from one of the largest Hawaii-themed private collections known to exist. The material covers the walls and overflows out of a shopping mall kiosk parked on plush artificial grass. 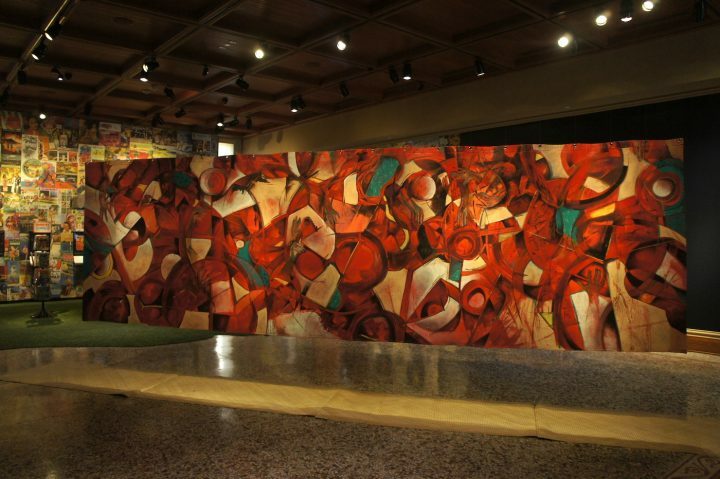 At the other end of the exhibit is a single work that serves as a counterpoint to the commercial art: “‘Āina Aloha,” a 20-foot-long, six-foot-tall, two-sided mural created by six Native Hawaiian contemporary artists: Al Lagunero, Meleanna Meyer, Harinani Orme, Kahi Ching, Carl F.K. Pao, and Solomon Enos. “The challenge was to present a story using iconography that was important, but also to use the mural as a way to paint away pain,” Meyer told Hyperallergic. 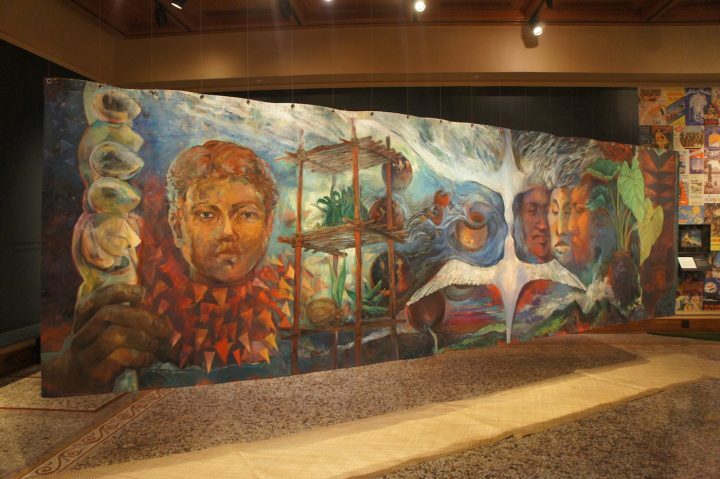 Reading from right to left, the “green side” of the mural tells a story of ancient voyages and genealogies, elders and ancestors building community, ritualizing ceremonies, and the generations of children that become future messengers of tradition. This side is “Hoopono,” recognizing beliefs, values, and practices. The other side is “Hewa,” a Hawaiian term meaning mistake, crime, sin, offense. It is an abstract onslaught of jostling shapes tearing against one another; brown hands and small patches of green are caught between jagged, overlapping layers of red, white, and black. Surrounding the mural are questions in Hawaiian and English: Whose child are you? What place claims you? Does the foreigner have responsibilities? The mural is a powerful presence that holds its own against the floor-to-ceiling bombardment of kitschy memorabilia across the room. But juxtaposing the two different works came close to not happening; when Scott Lawrimore, previously the director of the Jacob Lawrence Gallery at the University of Washington and chief curator of the Frye Art Museum, first stepped aboard as exhibit designer in late 2017, the show was originally called The Art of Selling Hawaii and had been first conceptualized as a way to showcase a large collection of Hawaii ephemera. One of Bishop Museum’s cultural advisors, Marques Marzan, a Native Hawaiian fiber artist, also expressed the need to balance the exhibit with a Native Hawaiian response. Marzan suggested the “‘Āina Aloha” mural, which was painted in 2015 and had traveled to nearly a dozen conferences from New York to New Zealand in the context of healing and wellness. At the John A. Burns School of Medicine at the University of Hawaii, the piece was included as part of the curriculum on historical trauma. “The calmer, hopeful side with lots of blue and green, that was the first side to be finished and it started as the trauma side. But when it was completed and all this pain was painted away, we realized we weren’t done with the pain yet, so we started again on the second side,” said Meyer. In pamphlets for the mural, Meyer and the artists encourage viewers to lap “‘Āina Aloha” several times, taking in the alternating red and green while having to circumnavigate this piece that sits in the middle of the room. Similar to Picasso’s “Guernica,” it’s a nod to the cyclical nature of work not yet being finished; of residual pain and resentment that continues to be processed. “I think for tourists that visit, there’s a giant question mark once they enter the room and their feet touch that artificial turf. Then they start hearing the stories and reading the text and, ideally, they begin to understand what’s at stake with these objects,” said Lawrimore. Of the dozen or so pieces that were framed or set under glass, wall tags provide context. In “The Fairest Flower,” a 1925 art print by publishing company Brown & Bigelow, a woman in a grass skirt sits in a patch of flowers, strumming an instrument against the backdrop of a beach and a smoking volcano. Except none of this is accurate: the volcano looks more like the Paramount Pictures mountain than Kilauea, grass skirts are originally from the Gilbert Islands, and even the flowers — poppies, violets, and forget-me-nots — are foreign to Hawaii. So is the woman, who appears to be Caucasian. The title refers to her, who is the “fairest” and most desirable according to the print, due to her light-skinned complexion. Thanks to the decades-long marketing efforts of Hawaii’s flourishing pineapple industry through the early-to-mid-1900s, the tropical fruit soon became synonymous with Hawaii, despite originally being native to Central America. A ‘60s-era poster promoting a “Royal Hawaiian Pineapple Split” represents the type of advertisement that has forever bound the idea of Hawaii with a piece of fruit. Orchids of Hawaii, which sold Hawaiian-grown flowers and party supplies, distributed an advertising mailer titled “Hawaiian Parties are FUN!” in 1955. Their directions encouraged themed cocktails (with pineapple, of course) and for guests to eat with their fingers while wearing “native” costumes. It’s a stereotypical depiction of Hawaiian culture, commodified into party decor. This entry was posted on Tuesday, January 15th, 2019 at 8:50 PM and is filed under Culture, ISSUES, Tourism.